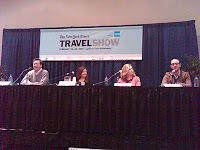 Travel lovers, you still have one more day to attend the New York Times Travel Show. The seventh annual show at the Javits Center on Sunday is the place to be for exclusive travel discounts, packages, and chances to win fabulous prizes on Sunday February 28. 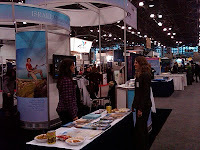 The show features nearly 500 exhibitors, representing more than 150 countries. There’s also a full program of travel-related seminars with experts like Val D’Elia of NY1 and Patricia Schultz, author of “100 Places to See before You Die,” from 10:30am – 3:30pm. 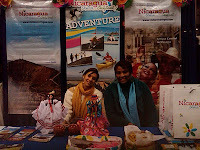 Here are some of the booths that I suggest you check out for some really wonderful specials and contests. Booth 1155/Tanzania Tourist Board: Sign up for a chance to win a Tanzanian safari for two, courtesy of Nanuri Safari Co.
Booth 107/Cruise Planners: Book a Norwegian Cruise Line vacation and receive up to $300 onboard credit, an onboard coupon booklet valued at $400 in savings, and up to six category upgrades on select ships. Or do the same with Princess and you’ll get a $100 reduced deposit per person and an onboard coupon booklet valued at $325 in savings. Holland America’s automatic deal is a reduced deposit and a coupon booklet valued at $354 in savings. Booth 935/American Express: Arrange and pay for your trip right here, and you'll get a host of discounts. Three that were especially appealing were Las Vegas’s Mirage offering up to 30% on your next reservation plus a $50 dining credit valid at any Mirage restaurant; a $500 reduction per suite on all Seabourn Sojourn sailings throughout Northern Europe when booking with an American Express card; and 20% off on Mexicana Airlines when using your American Express card. Booth 157/Japan National Tourism Organization: Sign up to win a special package tour to Japan with one roundtrip air ticket, hotel accommodations, and a one-day sightseeing tour.